The BPIF are delighted to bring you the 6th Visual Media Conference (VMC), a free to attend one-day event providing vivid insights into marketing communications. Organised by CDi, a special interest group of the BPiF, this year the VMC will explore how businesses can be truly sustainable in all areas by having an innovative and creative mind-set. The event features an extremely impressive line-up of speakers who will focus on emerging technologies - including mixed, virtual and augmented reality - and explain how they can be applied to give brands and companies greater real-world effectiveness. Ewan Douglas, Agency Principal at Channel 4 leads their Nations and Regions commercial business based in Manchester. Ewan works with advertisers, agencies and producers across the breadth of the UK and Ireland, and believes that bringing brands together with great content and audiences is enormously powerful. Ewan holds Channel 4's most senior role outside of London and is a strong advocate of the talent that thrives within the creative industries. With over 20 years' experience of cutting edge digital print technology, Jon Bailey, Chief Executive Officer at ProCo, is dedicated to keeping print relevant. He sits on the global board of DSCOOP, one of the world's largest digital print user groups with over 7,000 members, where he continues his mission to show people why it really is better printed. Jon's passion for print combined with his approach to leadership and culture make for an engaging and interesting look at the world of marketing operations. Vanessa Clifford is Chief Executive at Newsworks, the marketing body for the UK's national news brands that works with advertisers and agencies to help them harness the influence and context of the national press to deliver effective campaigns in a multi-platform world. Vanessa will be presenting on 'Beyond the masthead - unlocking the power of news'. Newsbrand audiences have never been bigger with growth is driven by innovation across digital channels, how do we ensure that newsbrands shine and thrive in a world where the industry is in danger of treating all digital as equal? Nic Sheen is Strategy and Product Development Director at Communisis. He has spent that last 15 years working with Financial Services and Retail clients developing solutions to automate marketing processes and deliver highly personalised communications, including Barclays, Sun-Life, LV, HSBC, Centrica and HomeBase. Joanna Stephenson is Marketing Partner at Parkside Flexibles, and will talk through the significant developments Parkside has made as a leading provider in Europe and Asia of fully accredited home and industrially compostable packaging. Joanna will focus on brand case studies and her experience in delivering unique packaging design to market. Olga Munroe, Head of the Retail Institute at Leeds Beckett University, will be presenting on Shaping Preferable Futures with Futures and Foresight. The Retail Institute champions proactive approaches for businesses to plan for the uncertainty ahead. Future & Foresight is a technique used by governments for policy development, and by large commercial organisations as a tool for exploration of future opportunities and challenges to ensure long term strategic growth. Andrew Pike is UK&I Marketing Manager at HP Indigo & IHPS. Despite working in print for over 11 years, Andy is in fact a millennial. With hundreds of messages being thrown at us every day, Andy understands the importance of marketing that stands out. He believes Print brings huge strengths, and when it is enhanced by the power of digital engagement it can result in great brand loyalty. 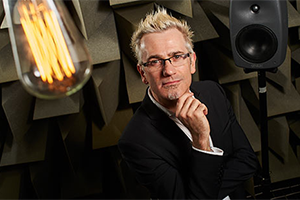 Damian Murphy is Director of Creative Media Labs and Professor of Audio and Music Technology in the Department of Electronic Engineering at the University of York. Damian will be presenting on Creative Media Labs: Immersive and Interactive Storytelling.